Millions of people are using computer software and the Internet to open windows to the past. AOL's online adviser Regina Lewis appeared on The Saturday Early Show to share some information. For most people, your ancestors had to arrive in the United States at some point. EllisIsland.org provides free information for more than 25 million passengers who entered the United States through Ellis Island and the Port of New York from 1892 to 1924. If you're stuck, ask Cyndi at CyndisList, a free portal with about 260,000 genealogy links, most of which are cross-indexed and categorized. The site is also big with those who are stuck and looking for new avenues of research. The site was created by Cyndi Howell, who lives in Washington state. A new trend in genealogy research is ancestry by DNA, offered at sites including www.ancestrybydna.com. At-home DNA test kits can be used to determine whether two people thought to be unrelated actually share a common ancestor. Swab your cheek and ship the DNA kit back, then wait 6 to 8 weeks for the results. The test kits are priced starting at about $100 and sell for as much as $800. Be sure to read the fine print on these sites, so you know exactly what you're getting and you have your expectations in check. A Web site called MyHeritage.com enables users to search across hundreds of genealogy databases at once, but the feature that gets the most attention is its ability to research family history through face-recognition technology. The idea is to upload old family photos of people you can't identify. Then, let MyHeritage.com try to recognize these people. If another MyHeritage user also contributed a photo with one of your mystery people, it will make the facial connection and you can get in contact with each other. It clusters faces based on attributes like bone structure and the unique characteristics of the person's eyes. Go from the known to the unknown. Always start with yourself and work backward, generation by generation. Float your family tree. Connect with distant relatives. Sharing can be critical when you hit roadblocks or sticking points. Ancestry.com has a feature will automatically connect a user's family tree to others worldwide if it finds common relatives with another subscriber. This brings about a social-networking component to genealogy. 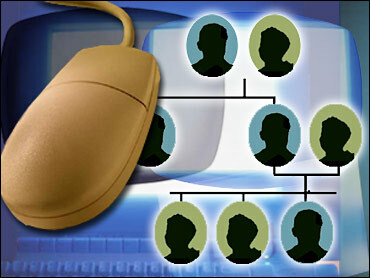 You're connecting online with close and distant relatives, you're sharing your family tree, maybe old photos and documents you've scanned in, etc. Don't delete your own history. Oral history makes up such a big part of how we track our history. And these days, everything is by e-mail. So all of those e-mails that talk about what your family is doing this year, consider saving those. Maybe start a digital diary, put them on a disk. Or, at a minimum, print them and keep them in the attic, because, you know, our grandchildren aren't going to be able to go upstairs to the attic and read deleted e-mails. So make a point of saving them. Scan old family pictures and documents. Store them in multiple places: on your computer, on CD-ROM and remotely via an online photo website to share with other researchers. Some products to help preserve your findings include the Family Tree Maker Software (starts at $39.95) or "Our Name in History" Book ($49.95) at Ancestry.com; Couple's Genealogy Tree ($120), Personalized Family Tree Frame ($75), or the Family Tree Birthstone Necklace ($140 to $1,380), all at RedEnvelope.com.